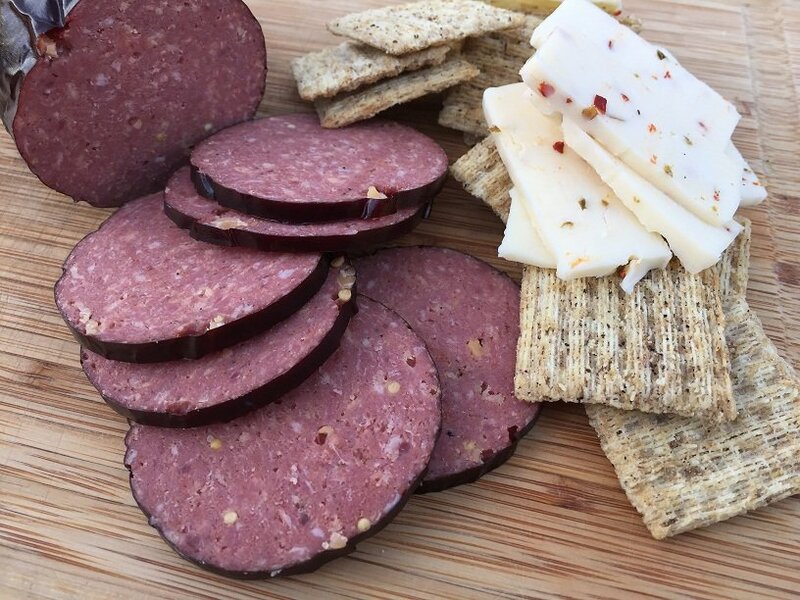 How to Make Summer Sausage: Easy, Delicious and Fun as Heck! 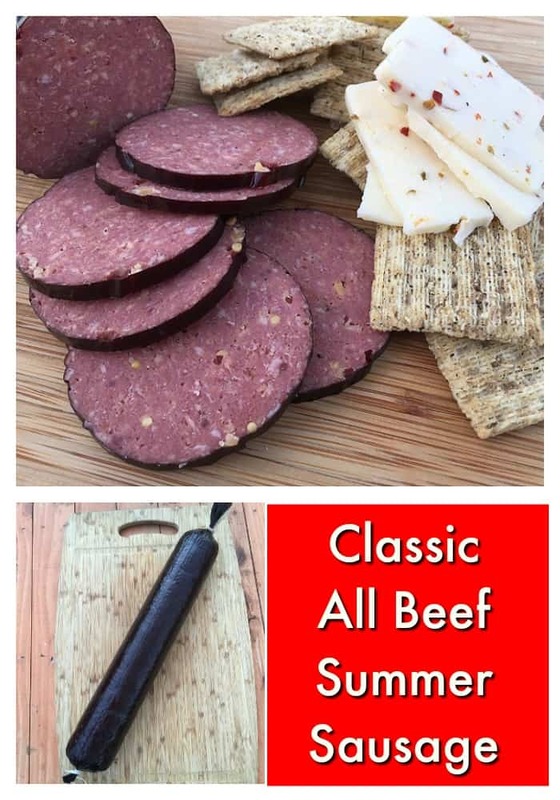 Let’s bust out the beef and learn how to make Summer Sausage! 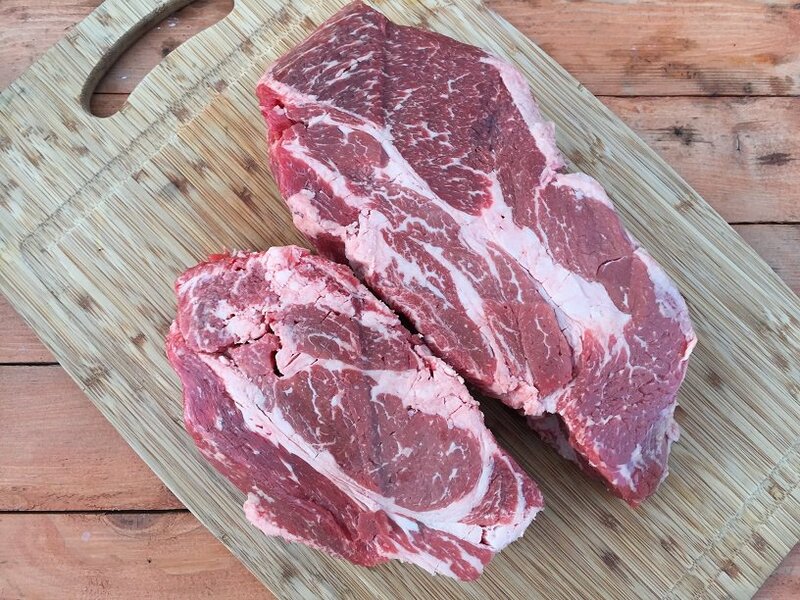 For this all beef sausage we are going to work with a Choice grade chuck roast. There is enough fat in this cut to make a decent sausage. 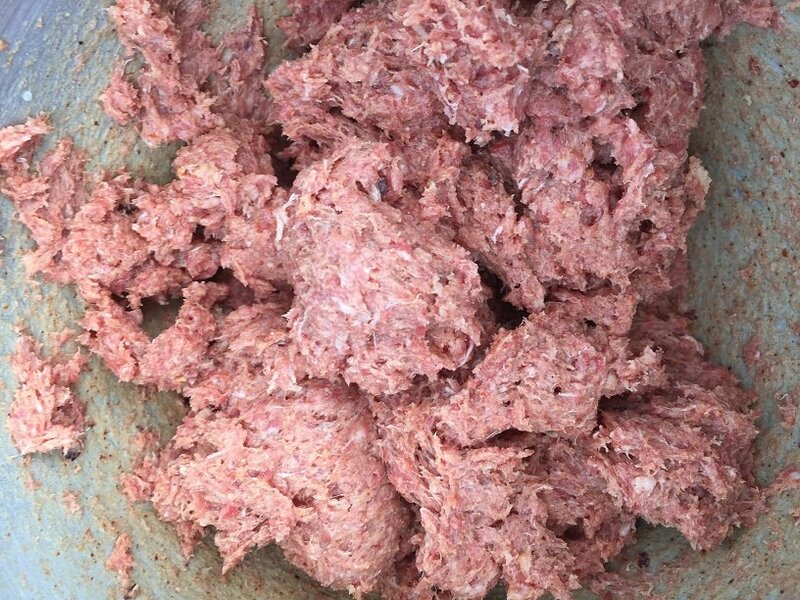 Follow the instructions about grinding that I gave you for pork sausage. In a nutshell, keep it clean and cold. You want a fine texture for Summer Sausage so we are going to grind this twice. If you need help choosing a grinder then here are my thoughts on the best meat grinders for different situations. Here is our beef after the first grind. And here it is after it goes through the grinder a second time. Now we add the seasoning and mix for about a minute with our stand mixture. Now stick all of that beef and the mixing bowl in the freezer for an hour. You have put a lot of heat into the meat and its time to get it cold again. While the meat is chilling you can use the time to soak your mahogany collagen casing in warm water. This will make it pliable and easy to work with when you are stuffing. After the meat has chilled and the casing has soaked it is time to get stuffing! I have found the easiest way to stuff these large casings is by using my CLEAN hands. 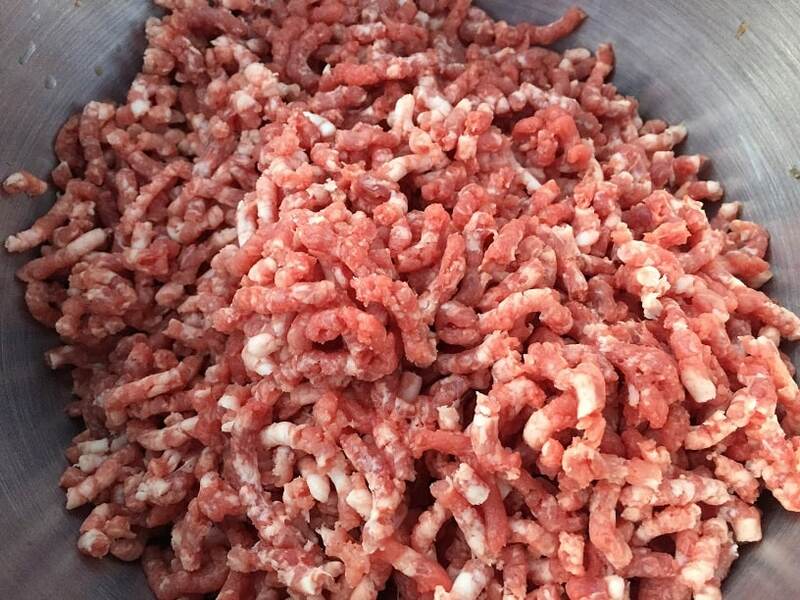 Scoop the meat mixture into little meatballs and just drop them in the casing. Every now and then squeeze and compress the casing to pack everything together. It really is pretty easy. Of course if you have a proper one inch stuffing horn that will work as well. When the casing is full simply tie it off with a piece of twine. The sausage needs to rest in the refrigerator overnight so the Morton Tender Quick has time to cure the beef and give it that nice rosy color. 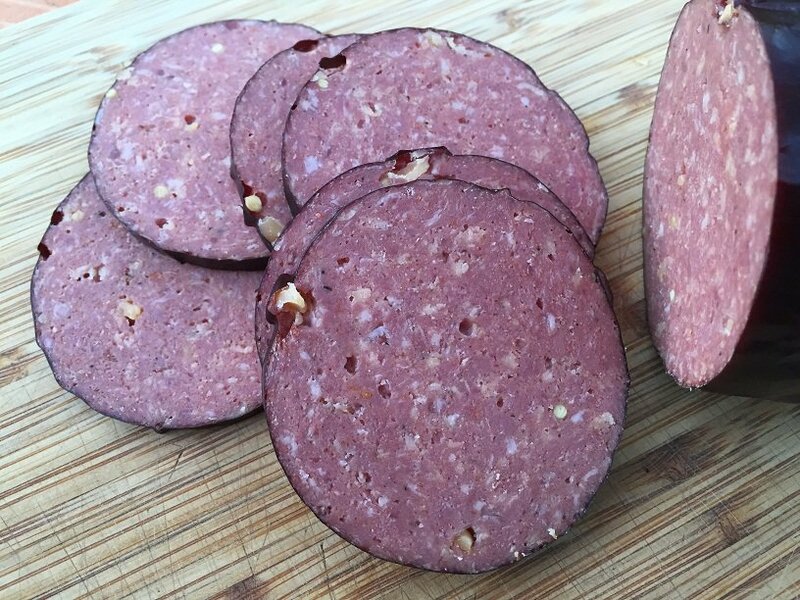 I cook Summer Sausage in my oven. I do NOT smoke Summer Sausage on my kettle. I don’t have enough control to smoke it as low and evenly as I need. 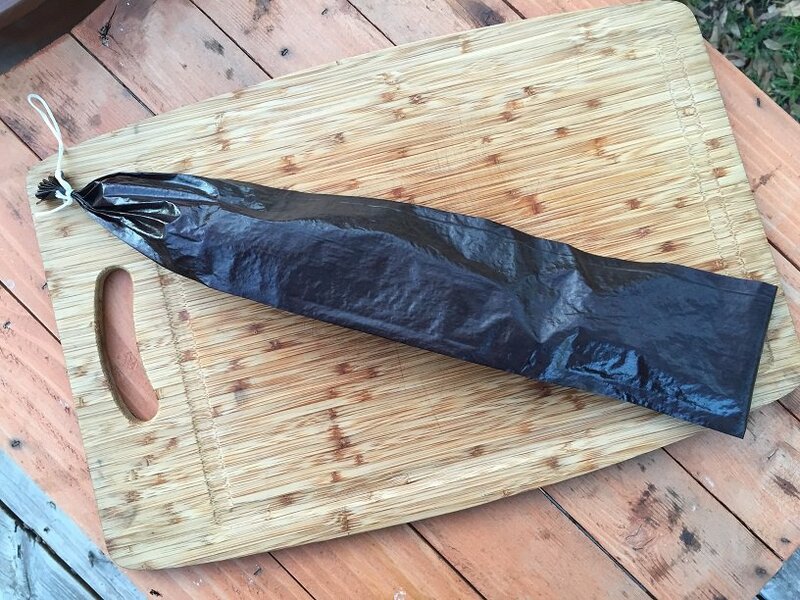 You want to gently heat your Summer Sausage to 155F and no further (well, okay..maybe 160F…but no further!). If you get this sausage too hot, too fast then you will ruin the fat dispersion in the sausage. Place the Summer Sausage on a rack over a cookie sheet. 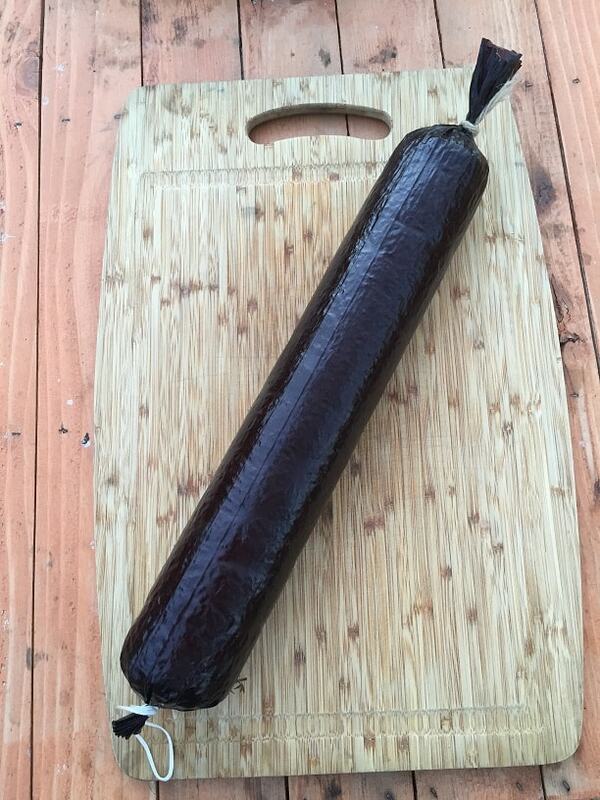 Place the Summer Sausage into a 200F oven until it reaches an internal temperature of 155F. This will take about three hours. Don’t take my word for it. Use a digital thermometer. Transfer the cookie sheet to the refrigerator and let the sausage cool completely before slicing. You can use this basic technique and change up the seasoning blend to make all different types of beef sausage. If you need a link to find casings, Morton Tender Quick or a grinder then you can find them on my Sausage Making Supplies page. 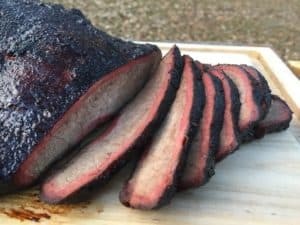 Hi Dave nice write up and recipe. The only thing I would change actually not much of a change just a shortcut. I would soak the casing before the mixing. Then I would stuff the mix in the casing immediately after the mixing when it is most pliable. The nitrites (in the Tender Quick) cure more quickly above 40°F so at this point I would not worry much about keeping it real cold as it’s going back in the fridge after the stuff anyway. Keep up the good work I enjoy seeing these posts and especially like this one a lot because it can be done without ANY special equipment. 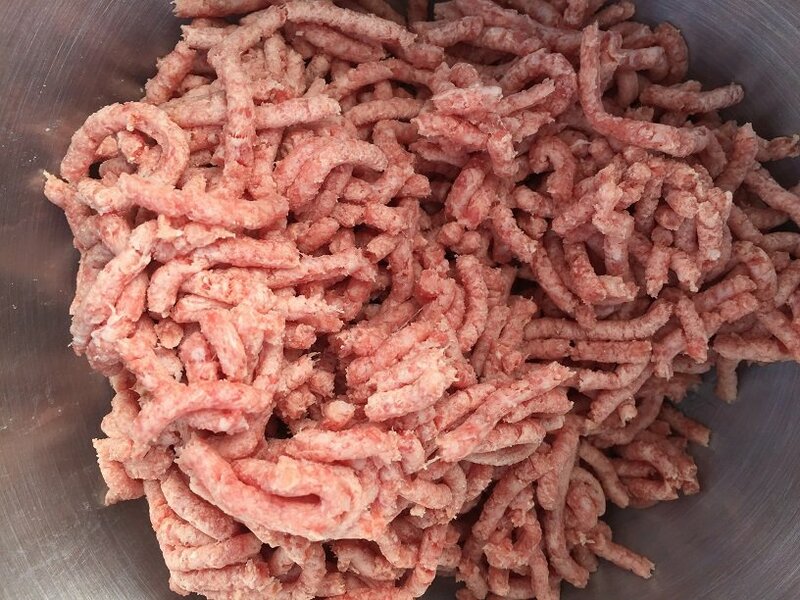 A person can buy ground chuck at the store add the mix ingredients then roll into log shapes before putting back in the fridge (No Casing). Leave the outside open to the air and it will skin over (called a pellicle) . Then just go to the oven as indicated or smoke ’em if ya got ’em. Great addition, Tom. Thank you!